To talk about who won a debate seems ridiculous to me. I understand why this happens in politics, where the only thing that matters to those who debate and to their respective parties is to sell an impression, an image, but in matters of nutrition/obesity to summarize a debate with a poll that determines who is the winner is useless. It only shows which thought group has more followers. You can launch the poll before the debate, and you will probably get the same result. Let’s forget polls. Let’s talk about what arguments they have used and let’s talk about what we think about their arguments. If the only “argument” we have is to make the rest of our group shout “X won”, where X is our “king’s champion”, what we promote is sectarianism and the defense of beliefs that may be wrong. Did Taubes win? Did Guyenet win? Irrelevant questions that lead to irrelevant answers. Moreover, when people talk about who won a debate, they go beyond who has better rational arguments. If we read the comments on youtube in regards of this debate, we will clearly see that there are a lot of references to the condescendence (i.e., arrogance and air of superiority) of one of the participants. To say that A or B have lost the debate because they are insufferably arrogant is useless. Or, rather, it is the part of “losing the debate” that is useless. I think it is important to highlight the ad hominem arguments, the use to the argument from authority or the arrogant manners (like affirming that one’s opinions are science, while those of the opponent are story-telling). In these attitudes there is no “rational argument”, but there is an attempt to convey that you are right and that your oponent is a moron who does not know what he is talking about. Humility, on the other hand, is interpreted as a lack of faith in one’s beliefs. Arrogance does not convey to me a sense of “professional competence”, and neither do these letters that certain people write after their names. I do not care if you have one or four PhDs, if your arguments are garbage. I will probably comment these arrogant behaviors, just to highlight how these non-rational arguments are used to “win” the image battle. Was it an interesting debate? In my opinion, it was. Unpleasant to watch, but interesting. One thing has nothing to do with the other. Please note that even when some of the hyperlinks I use in this article lead to Spanish-language blog posts, the titles of the scientific articles I comment in those posts are always clearly visible. In this first part I comment the first half hour of debate. I start with my notes on the topics covered, indicating who was talking and when. SG [1m30] “The brain circuits that regulate body fatness”. SG [3m30] Aliens analogy, car, wheels, speed, brain. SG [5m] The brain regulates the size of adipocytes. Adipocytes do not regulate their own size. SG [7m] In people who get fat there is a change in the regulatory mechanisms. A person who gets fat is not simply a thin person who eats a lot. SG [8m30] The genes associated with obesity are genes related to the brain. SG [10m] Drugs approved to fight obesity are based on eating less (reducing appetite or reducing nutrient absorption). No “effective fat loss drugs” targets either insulin or adipocytes. SG [11m30] Genetic mutations that cause obesity do so by affecting the signaling of leptin. Leptin is the main hormone that regulates body fat. SG [14m] The effect of sugar + fat cannot be completely replicated with only sugar. Guyenet attributes it to palatability. SG [15m] It is not possible to obtain, either in animals or in humans, the same increase in energy intake with sugar and carbohydrates than with tasty food that combines fat and carbohydrates. GT [17m] When asked if calories “matter”, he answers that it is the wrong way of thinking about the obesity problem. GT [22m] Obesity is a problem of fat accumulation, not an energy balance problem. SG [26m] What differentiates a story that is true from one that is not, is the evidence. The genetic propensity in obesity has to do with the brain. 75% of the difference in body fat between individuals is due to genetic differences between them. The environment is much less important. Guyenet, PhD (I will omit the PhD from now on for conciseness and readability reasons) from the beginning talks about “the brain circuits that regulate body fatness”. He does not say that they influence, he says that they regulate. Recall that shortly before the debate Guyenet criticized Taubes (see) by saying that he believes that his hypothesis was the “primary” mechanism that caused obesity, instead of being open to other mechanisms being important. Here we see clearly Guynet’s hypocrisy, when he says on his part that body fat is regulated by brain circuits. The analogy he uses is that of some aliens who observe the behavior of cars and try to understand why some cars go faster than others. He says that if they did the analysis observing the behavior of the wheels, they would not understand anything, because the speed is determined by the driver, that is, by the brain. The analogy is just surprising, since it does not contribute anything at all to our understanding of the problem. If obesity is regulated by our brain, the analogy will be adequate, but if it has more to do with Taubes’ ideas, the analogy will be simply wrong. This analogy is a waste of our time. The argument is a fallacy because nobody says they do. The hypothesis that Taubes defends is rather that it is the stimulus received by the adipocytes (insulin), modulated by the response of certain organs to that stimulus (insulin resistance), which will ultimately determine whether there is a net accumulation of body fat or there is not. The correct question is: do the stimuli that the adipocytes receive regulate their size? So, the populations that follow their ancestral diets (no flour, no sugar, no seed oils, no processed products, etc.) have a brain that is different from ours? It seems to me that the environment (i.e. what we eat and how we live), is the #1 cause of obesity, neither our brain nor our genes. 100 years ago we had the same genes, exactly the same ones, but we did not have an obesity epidemic. Is it our genes’ fault? When a group of people migrate from a non-westernized culture to a westernized culture, in general these people gain weight. Do they gain weight because of their brain or is it because of the environment change? Of course, when exposed to the same stimuli some genetic dotations will react better than others, and similar genetic dotations will react in a similar way, but the real cause of the problem is the inappropriate stimuli, not the protective capacity of our genes to cope with that insult. Is obesity 75% genetic? No, 100% seems to be caused by environmental factors, as demonstrated by the fact that obesity only appears when the environment becomes westernized. On the one hand, it is a fallacy to associate “FDA approved” with “effective”. There are not, to the best of my knowledge, effective weight-loss drugs. They produce weight loss in the short term, just as “eating less” does, but they don’t work in the long term (see, see). To use the word “effective” is fallacious, because those drugs approved for use by the FDA are not effective. On the other hand, Guyenet uses the fallacy of the single cause, which is to assume that a certain condition (weight gain or loss) has a single cause. Even if the approved weight-loss drugs were effective at making people lose weight by making them eat less, and they are not, that does not mean that other causes for the same outcome are not possible. And a drug may not be viable not because it does not work, but because of other difficulties, such as its side effects or the difficulty of keeping the active principle in optimal conditions until the day it is used. For example, the fact there are no effective weight-loss drugs that target leptin, is a demonstration that leptin is not involved in obesity? Applying Guyenet’s reasoning we would have to conclude exactly that, that leptin is not involved in obesity. Until the day someone comes up with a way to produce a viable drug that targets leptin, in which case, magically, leptin will be involved in obesity. Guyenet’s argument is nonsense. On the other hand, are there experiments with drugs that reduce insulin? Yes, there are: diazoxide (see), for example (see). Again, fallacy of the single cause: the fact that a cause produces the effect, does not mean that other factors cannot cause it too. For example, in insulinomas there is usually a considerable weight gain (see) and it is known that insulin injections can cause accumulation of fat at the injection sites (see) and also weight gain (see). It is possibly one of the most interesting comments from Guyenet in this debate segment. What he says is that you cannot completely replicate the result of consuming a tasty diet that combines fat and sugars, using a diet that mainly contains sugars (rice and sugar, for example). He says that if you increase the consumption of sugar in animals or in humans, you make them gain body weight, but this gain is modest, in comparison with what you get when you use a diet dense in calories, tasty and that contains both fat and carbohydrates, and, according to him this result shows that sugar and carbohydrates cannot explain the full effect. I think that piece of the video (min 13:00-17:30) must be watched, not listened, so you can observe Guyenet’s face. I get the feeling that Guyenet is unable to explain exactly what he is saying. Especially because it seems clear that he does not want to use the word “calories”. And I think he does not use it, because it would be too clear that he is saying that, for the same amount of calories, a diet that contains sugar and fat will be more fattening than one containing only sugars. Because if he’s not saying that, nothing he is saying makes sense. If it were all a matter of calories, it would be possible to replicate the result of one diet with the other one, just by making the diets isocaloric. But that’s not what he says. I agree: a diet with sugar and fat can be more fattening, at least in the short term, than a diet that only contains sugars. Even when calories are the same. All rats gained weight on the high-fat diet, but their body fat composition differed. Fat tissue in the tallow group was 10.3% linoleic acid, 15.2% in the olive oil group and 54.5% in the safflower group. Relative to the tallow group, rats in the olive oil group saw to 7.5% increase in total body weight, and the safflower group saw to 12.3% increase. So, if these are his beliefs, how can he say that it is the caloric intake what determines the changes in body weight/fat (see)? There are many questions that have the same answer: this is Guyenet, PhD, a guy that can say one thing and the opposite and behave as if he is right in both cases (see Note #2 below). The investigators showed that mice lacking these proteins have a normal food intake and body fatness when fed standard lab chow, but unlike normal mice both mutant strains are almost completely resistant to fat gain when given a sugar solution. This is despite the fact that they drank a similar amount of sugar as the normal mice, which became obese. Basically, they drank the sugar water but it was no longer fattening once it didn’t taste sweet. Are we paying attention to this? He is saying that regardless of its composition and its calories, if the sugar does not taste sweet, it does not make you fat. Let’s see the results of that experiment, because they are interesting. In a first experiment, the Task1r3 KO mice follow two different diets: the control group consumes chow (Con) and another group (Suc) consumes a large part of the calories as sugar. In the upper part of the following graph we see the energy intake of both groups, where the white part of the bar represents the fraction of calories that come from the sugar solution. In summary, the group Suc consumes more calories than the group Con. But, as we see in the other two graphs, that group does not gain more weight nor more body fat than the Con group. Higher energy intake, but there are no differences in the body fat that is gained. Are not the “extra” calories what makes us fat, Guyenet? But there is more good stuff here. In a second experiment, a small amount of fat emulsion is added to the diet, making it much tastier. And now those same mice that didn’t gain body fat while ingesting a high amount of sugar and more calories, now they do get fat!! by consuming essentially the same food that was not fattening for them in the previous experiment. And now they gain considerably more body fat with little difference between groups in the energy intake. Our results suggest that nutritive solutions must be highly palatable to cause carbohydrate-induced obesity in mice, and that palatability produces this effect in part by enhancing nutrient utilization. Unexpectedly, the diet-induced obesity appeared to be due in large part to increases in carbohydrate utilization not caloric intake. This is illustrated most clearly in Tas1r3 KO mice, which exhibited elevated caloric intake but no excess weight gain on the Sucrose diet compared to WT and Trpm5 KO mice. However, when offered the highly palatable Suc+IL solution, the Tas1r3 KO gained a significant amount of weight although their caloric intake was not elevated. Perhaps it seems a little contradictory that the same guy who knows that, with the same amount of calories, one diet can be more fattening than another because it has a different composition (and we have just seen two studies cited by Guyenet himself on his blog), ends up saying that controlled scientific studies show that changes in body weight depend only on calories (see). But these contradictions have an explanation: this guy is Guyenet, PhD. NOTE #1: In the final part of this segment, Guyenet, PhD comments that “what differentiates a story that is true from one that is not, is the evidence”. Let’s not be fooled by the arrogance. Guyenet, PhD presumes to have an opinion based on evidence, unlike Taubes’ opinion, which he describes as “story-telling”, but his proclamations just show his lack of humility. 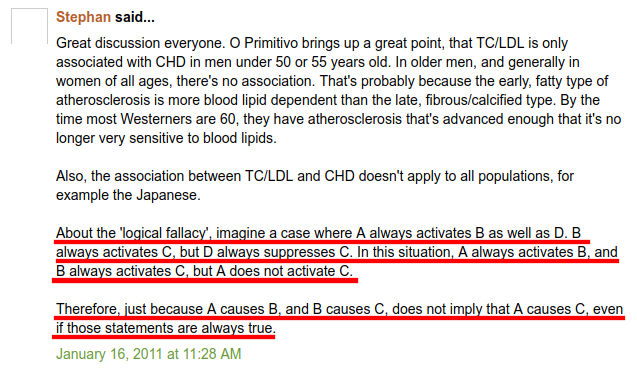 About the ‘logical fallacy’, imagine a case where A always activates B as well as D. B always activates C, but D always suppresses C. In this situation, A always activates B, and B always activates C, but A does not activate C.
Therefore, just because A causes B, and B causes C, does not imply that A causes C, even if those statements are always true. If A causes B and B causes C, for sure A causes C. Whatever Guyenet says. This guy’s mistake lies is in the premises: he cannot simultaneously hold that “B always activates C” and that “D always suppresses C”. Because when B and D occur simultaneously, one of the two premises must be false for sure. When his error is fixed by saying that “B activates C except in the presence of D”, the apparent paradox is no longer a paradox. And this guy has a PhD? Yes, he has a PhD. And he also has logic mistakes. And he also makes blatant errors interpreting data, as I will comment soon (see). NOTE #3: Guyenet posted a document with comments and bibliographical references in order to cite them easily during the debate. What is the probability of three guys that have a PhD making an honest wrong interpretation of something as simple as the causality of the carbohydrate-insulin model? Full of straw-men? Wildcard criticism with no actual argument. His review seems to spring from a closed mind. It's biased and full of straw-men. If overeating is not a requirement for fat gain, Guyenet’s model for obesity is refuted. Because he says it is a requirement in his model (min 54). I am still waiting for real arguments from this open-minded guy. I am sure he can do better than this. Come on, Tucker, don’t be shy. What is the point of this? What do we learn from this?